Self-catering accommodation on a fruit farm in the beautiful Keisie Valley, 24 km outside Montagu, on the road to the Koo Valley, this is perfect for a retreat. We are at the bottom of the spectacular Burger’s Pass and have four cottages of varying sizes, a swimming pool, lovely hikes, wonderful bird life and in season you can watch us harvest (or pick your own!) gooseberries, hanepoot and merlot grapes, apricots, peaches and quinces. We also have a lovely organic herb garden where you can help yourself to herbs for dinner. There is an indigenous water-wise garden behind the cottages and two acres of roses next to the swimming pool! You can also pick your own roses for R3 a rose. 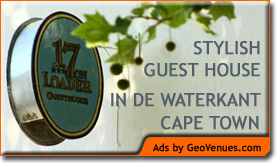 The cottages are self-catering, linen is provided and each has a large fireplace as well as a braai outside. Best of all – VERY affordable rates! Each season is special in its own way – Spring is stunning with the roses and fruit blossom. In Winter we have lovely sunny days and cold nights for cuddling up in front of the fireplace. Summer has hot days and cool nights – and in Wynberg you don’t get stars like this! Autumn of course brings nature’s beautiful colours and wonderful weather. Dogs are welcome if they are friendly and bring their own bedding !